i3 Plus by Bestar has been created to adapt to your living space with the flexibility of its configuration possibilities. Its sleek design is Intelligent, Inspiring and Innovative. On ball-bearing slides for smooth and quiet operation. Honey-Can-Do CRT-02348 3-Drawer Rolling Fabric Cart, Pink. Getting organized has never looked better with this impressive fabric cart. The smooth rolling storage unit has three spacious drawers to hold clothes, tools, or anything else you need tucked away. A soft top surface provides even more storage space, and can double as a night-stand. Two locking wheels keep the cart securely in place as needed, and unlock for easy manoeuvring around the room. You're the creative type the kind who always has a story on your mind, an art project baking on the backburner. That's why this Portable Laptop Desk with Built-in Handle is your trusty sidekick both in and out of the studio. It's chic and compact in terms of laptop ergonomics, while its lightweight design makes it more savvy than a triple word score. You can rely on solid MDF construction to keep the surface cool when you're working through a hot idea. A perfect laptop table for your couch, your trip or your actual lap, it's also a fine place to park your 13-inch typing device and launch the project of your dreams. Honey-Can-Do TBL-06320 Portable Lap Desk, White. This versatile lap table has a large, solid surface that is perfect for laptops, writing and reading. The soft and comfortable cushion is wedge-shaped for ergonomic typing. The space-saving design includes a built-in carrying handle that is comfortable to grip. P-35C Cross-Cut Shredder is rated 3.9 out of 5 by 7. Rated 5 out of 5 by pttt from Best Awesome little machine ..Perfect for personal use. Rated 4 out of 5 by shreddedChic from P-35C Review Is strong and fast. I was concerned about staples but cuts right through them. I will recycle the shredded paper as chicken coop bedding and then recycle the used bedding into compose. Rated 3 out of 5 by 1676 from P-35C well designed and a compact design; good safety features. Rated 5 out of 5 by shredder2014 from Surprisingly Great I had no idea what to expect. This was my first shredder purchase and I'm so happy I stumbled upon this one. It's very safe to use and it is very easy to set up. The shredder runs very smoothly and I'm so glad it accepts staples. Rated 4 out of 5 by shredder22 from fine for the price this shredder is good for the price. it struggles at 4 thicker sheets of paper but can do 4 regular thickness sheets just fine. After going through a big basket of papers (allowing it to rest in between as per instructions avoiding continuous use) it didn't jam so that makes it a good shredder in my books. One trick - it will only work if it is sitting on the wastebasket the correct way. If you are wondering why it won't work, flip the direction of the wastebasket underneath. So far this unit is fine, we'll see in a year if it's still working! 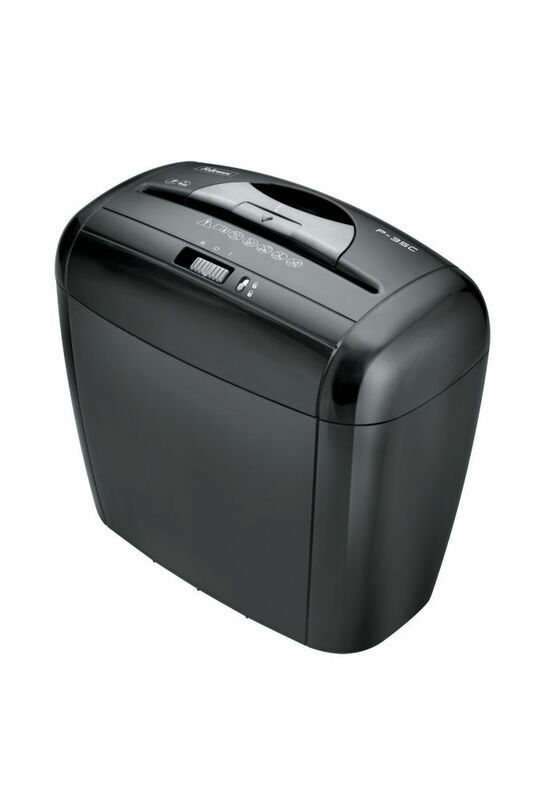 Rated 1 out of 5 by Marylou from Disappointed I looked forward to owing a Fellowes Shredder so I purchased one. I have the same review as the one made on May 26, 2013. Am disappointed with the time spent waiting for it to cool down and not knowing if it will work or not. It's a trial and error for me. Right now, I waited 30 minutes and still it's not working. Also, the wastebasket on which the shredder sits on is very flimsy compared to the heavy structure of the shredder so a lot of times it topples down. I have to get my vacuum cleaner to help me clean up the mess. It is such an inconvenience ! Maybe you can improve the quality of the basket and make it sturdier. I wished I still have my receipt so I can return this product.